Geography is one of the most useful subjects that a child can learn. 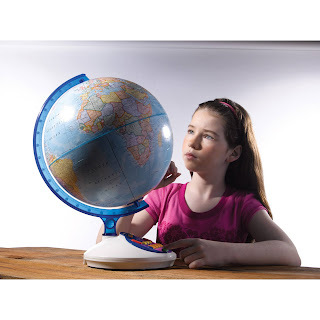 There are plenty of fantastic educational toys available, however a globe is one of the few toys that a child will never out grow a globe is a great investment in educational future of a little one. 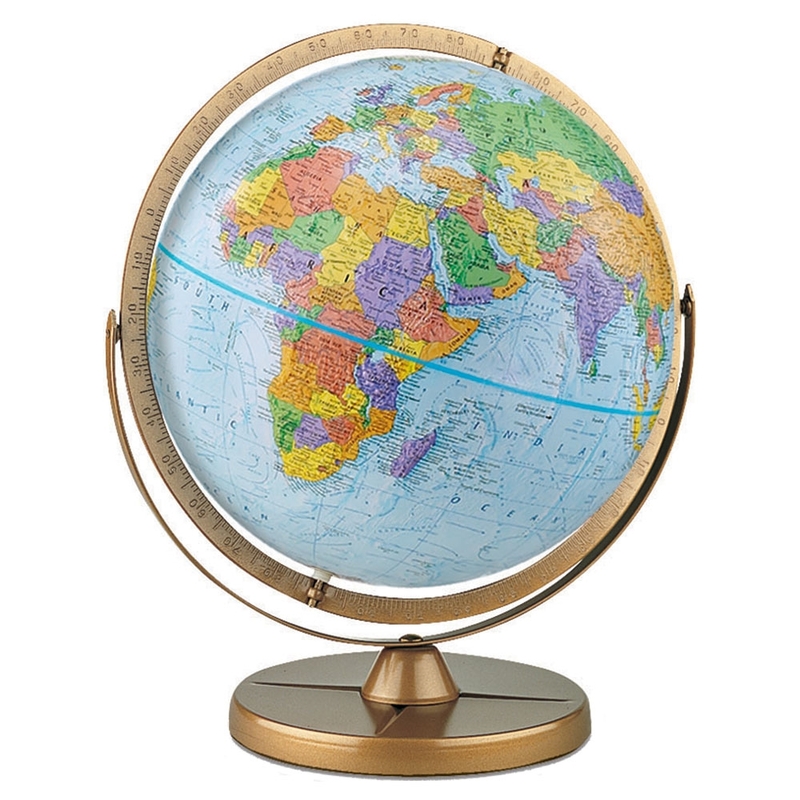 As a small child, a globe is a fun thing to spin around while learning about different landmarks or major cities. 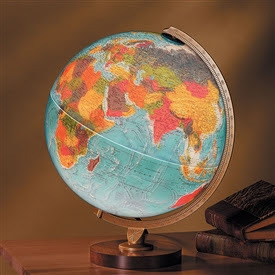 As a middle school or high school student a globe becomes a reference tool for social studies classes. Take a look at our selection of holiday gifts ideas for children. 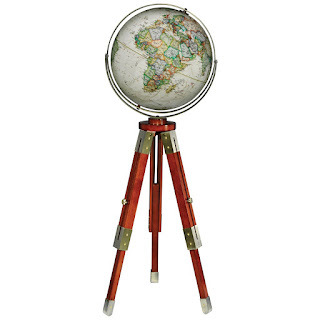 Scout II Globe features a 12-inch sphere designed for a desktop. A rotating base makes for easy viewing. This model is compact and easy to fit in an office and home. Over 4,000 landmarks which included oceans, landmarks and continents are featured in full detail. Detailed oceanography makes the globe unique. A great reference tool for completing homework assignments. An internal LED makes this an excellent choice as a night light. The lighting feature enhances the cartography when used in the dark. 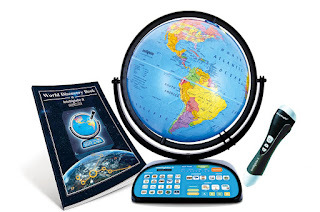 The Geo Safari Talking Globe is an excellent choice for any young scholar, featuring over 10,000 questions about geography and cultures around the world. Move between multiple players modes from beginner to advanced. There are three categories for trivia questions. One selection of questions is based on the United States and Canada, a second group is based on the entire world and a third group of questions is based on the World, Canada and the United States. Each globe features high quality digital sound, an volume control, automatic scoring, help and repeat buttons as well as international music. The 12- inch sphere rests atop an acrylic stand, this model can be enjoyed by up to four players. AC Adapter or 4 size C batteries are required. The Intelliglobe is an interactive and educational toy with significant longevity. Adults and children can enjoy geography adventures from the comfort of home. Talk about various landmarks, plan a road trip and ask each other trivia questions. Several different player modes means that there are a host of games to enjoy. The fun of a video game combined with the learning potential of an educational toy. Over 2.5 hours of educational material with the option to connect to an app via iOs or Android to update the device with new material. A USB cable is included for recharging the Intellipen. A World Discovery Book is included. 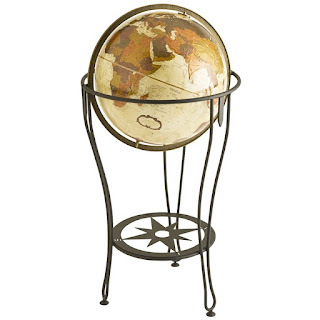 The Pioneer Globe by Replogle Globes is a 12- inch raised relief sphere resting a top a metal, bronze-colored stand. A full swing meridian allow for easy accessibility and navigation. This particular model is unique because few table top globe feature a full meridian. Detailed descriptions of oceanography and topography makes this an excellent reference tool for years to come. The continents, countries and coordinates are outlines to provide a comprehensive representation of Planet Earth. 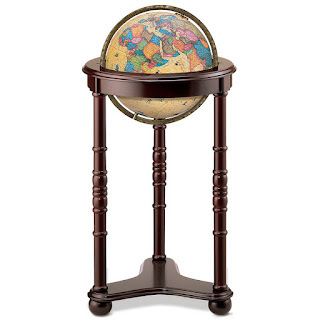 The stand and sphere reach a combined height of 17 inches tall a convenient size for any classroom, home or office. Such a great value for this price point. Globes make excellent choices for holiday presents. 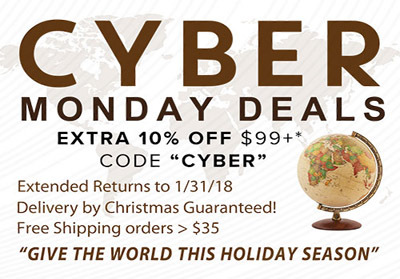 A miniature Planet Earth is an ideal gift option for the person who has everything. This convenient yet sophisticated gift option is compact, aesthetically appealing and practically useful. 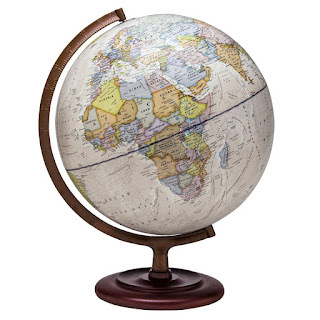 Here are our suggestions for the 5 Best Desktop Globes for presents this holiday season. 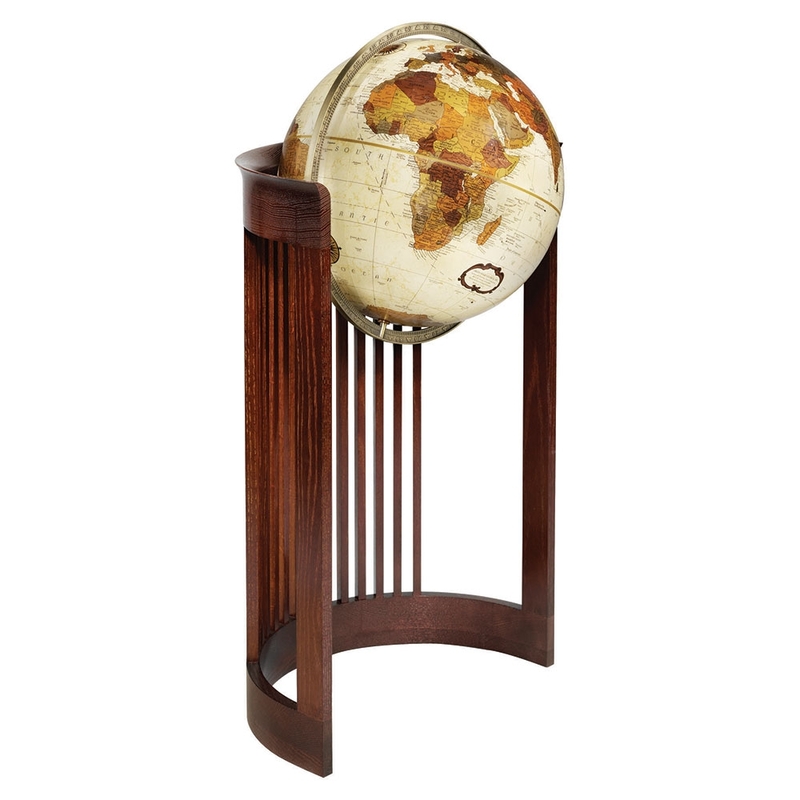 The Livingston Globe by Replogle is a 12-inch blue ocean sphere featuring raised relief and mounted on a traditional yet modern stand. The countries and continents are depicted in vibrant detail. A solid, disc shaped base and a golden, metallic stand add classic touches. The Livingston features clean lines and a simple aesthetic. This reference tool is an excellent accompaniment to any office, classroom or home. Resting at top its stand the globe reaches a height of 16 inches, its is 13 inches wide and 12 inches in diameter. At just over 3 lbs it is light and easy to transport and hold for viewing accessibility. The Freedom Globe from Replogle Globes is a classic and appealing addition to any desk. Tributes to both nature and American heritage resound throughout the design. 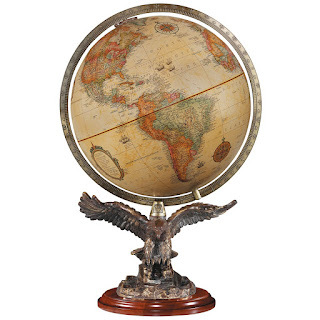 The 12-inch sphere is mounted on a bronze relief of an eagle with its wings spread in flight. The view of this majestic creature taking flight adds artistic appeal and inspiration. The metallic eagle rests on a wooden base. 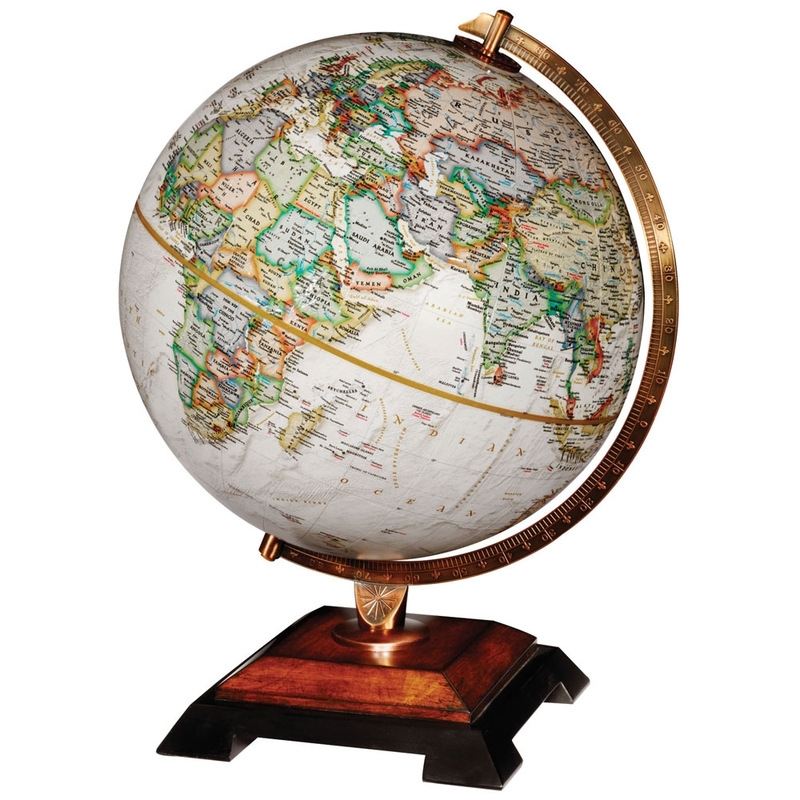 The sphere feature antique oceans and raised reliefs with detailed depictions of various continents, oceans, countries and landmarks. 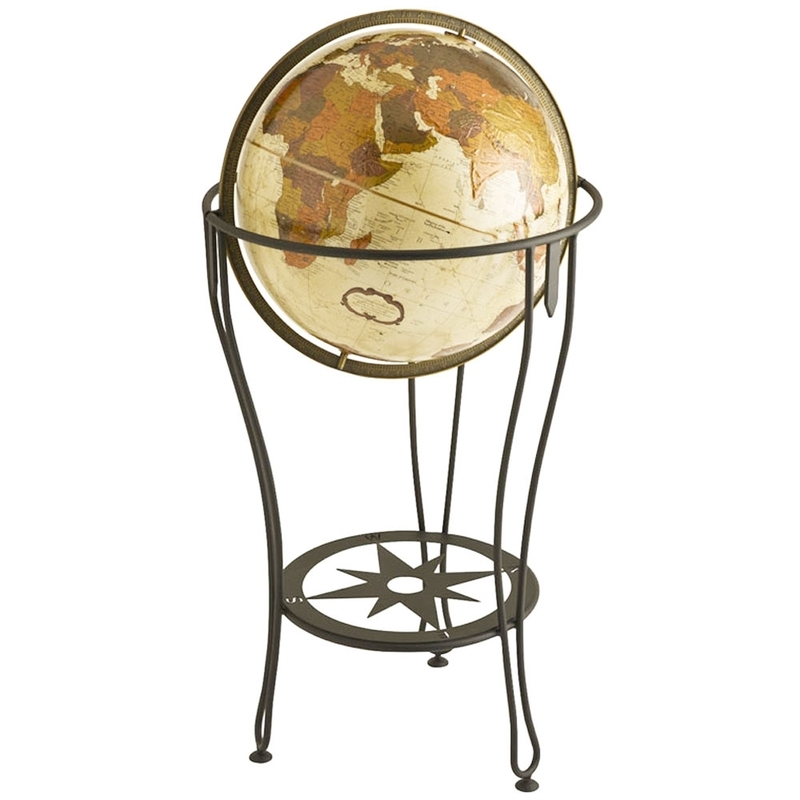 Assembled dimensions are 20 H x 13.5 W x 12 D.
The Ambassador globe by Waypoint Geographic features an Antique Oceans sphere and bronze, numbered semi-meridian. 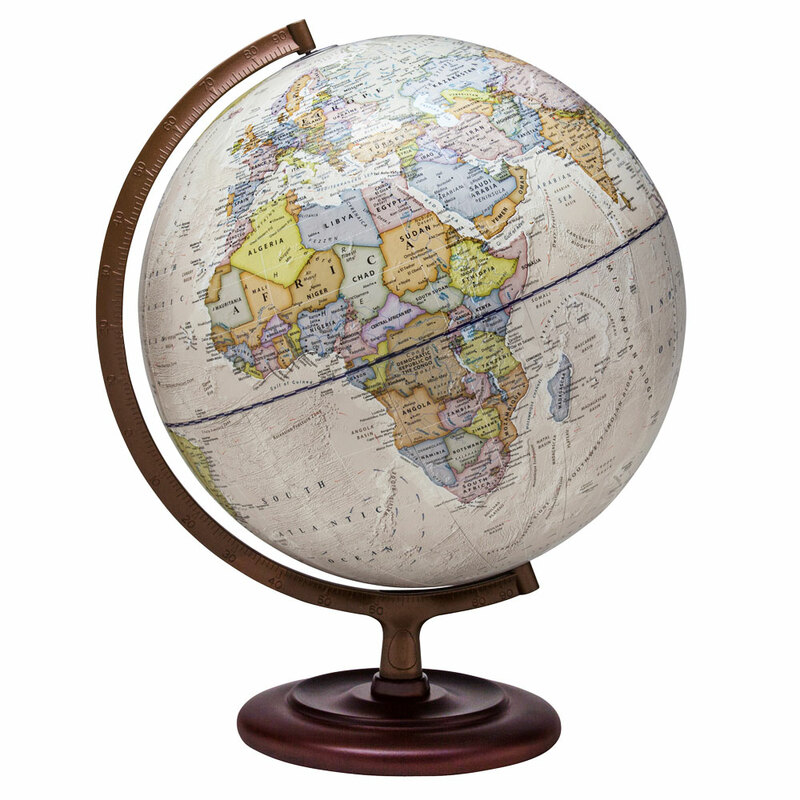 The 12-inch sphere is mounted on a circular wood disc that is finished in dark cherry. The two tier design add a touch of classic elegance. Detailed ocean cartography adds to the reference value of this desktop guide. Geopolitical boundaries and landmarks are current and reflect that latest information. 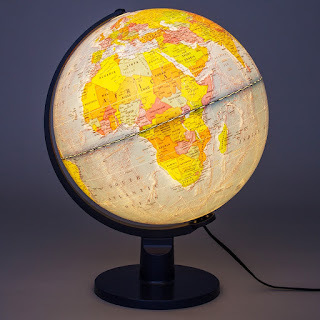 The assembled dimensions of this globe are 17 H x 13.5 W x 12 D.
The Bingham globe from National Geographic is a tribute to the explore of the same name. The classic yet bold styling is reflective of a bygone era. The 12- inch antique oceans sphere rests on a two-tone wooden base and features a diecast semi-meridian. The raised relief map provides detailed descriptions of the continents, oceans, countries and landmarks. 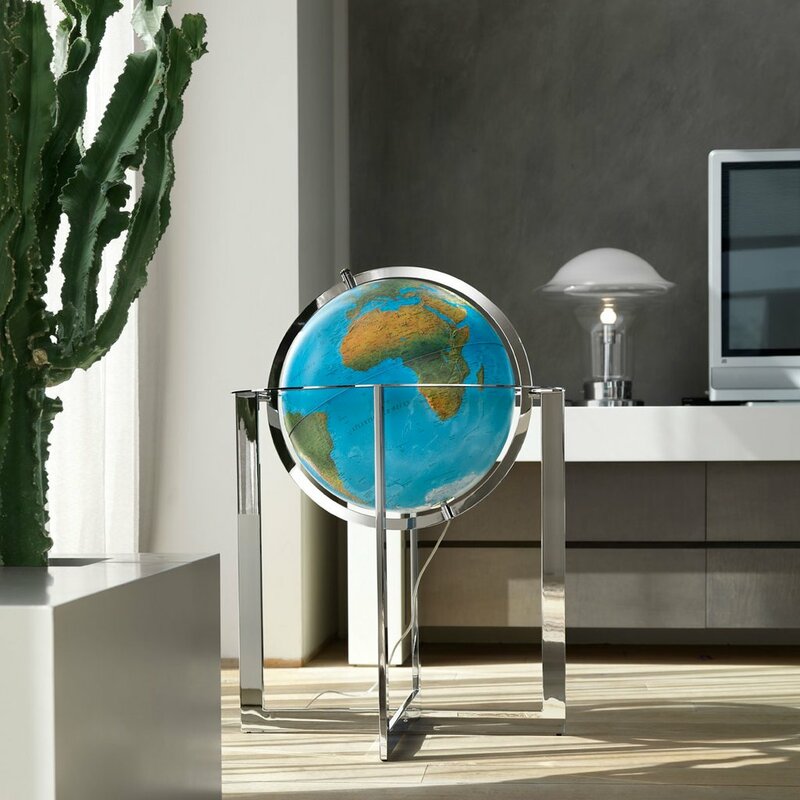 The assembled dimensions of the globe are 16.5 H x 13 W x 12 D .
For an elegant and interesting piece of desktop art look no further. The MOVA Blue Ocean Relief Map Revolving Globe 4.5-inch is a beautiful and simple option. 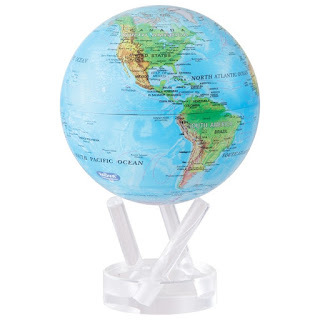 This one of a kind globe silently rotates on its 3 pronged stand. Solar cells utilize magnetic force and ambient light to generate power. The effervescent blue of the oceans is a pleasing contrast to the neutral continental color schemes found on the continents and countries. The assembled dimensions of the globe are 7.25 H x 4.5 W x 4.5 D. This one of kind globe weighs only three pounds. Easy to transport and enjoy. This new addition to our collection is a great choice for the little scholar in your life. Unlike most of our globes, this model features an option for boys and an option for girls. The Safari Explorer Blue Oceans Animals Globe is a 10-inch illuminated desktop perfect for a little boy who loves animals and geography. The continents and oceans are depicted in vibrant, brilliant blue. Over one hundred landmarks, animals and other illustrations cover the globe. An internal LED makes using this as a night light or back light a great option. The internal lighting also enhances cartographic features making them easier to read and more distinguishable. A sturdy acrylic base provides support and is also the same color as the sphere. 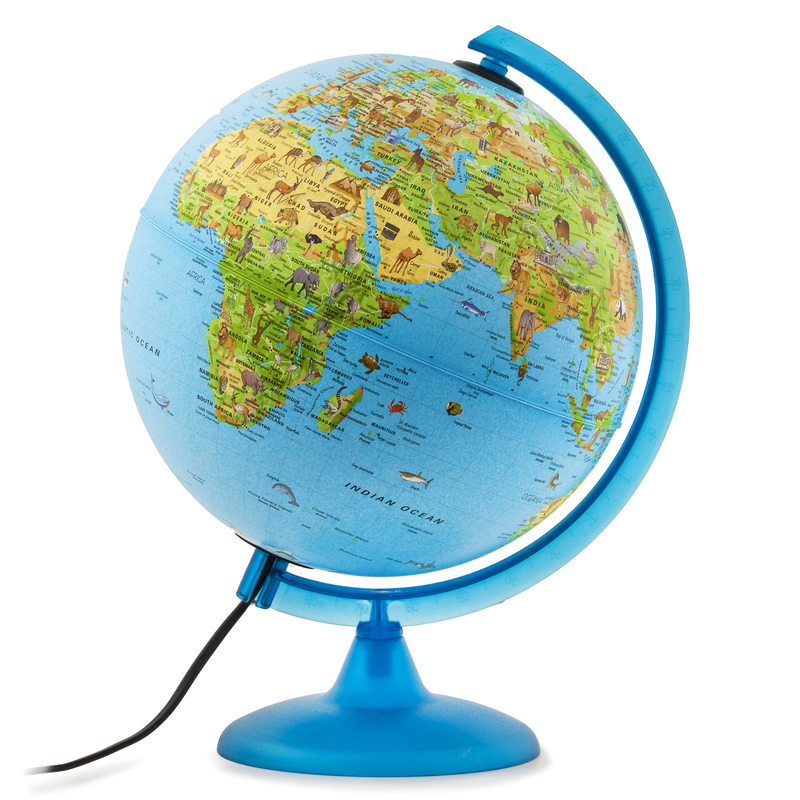 An attached cord is located between the globe and the meridian at the south pole. An inline switch makes it easy to access this feature. A semi-meridian makes for easy navigation for finding coordinates and various locations around the world. 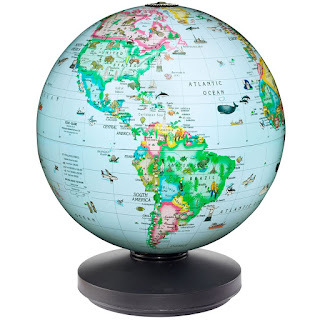 The overall assembled size of the globe is 14"h x 10.5"w x 10"d.
The Safari Explorer Pink Ocean Animals Globe is a 10-inch illuminated desktop kids globe featuring pink oceans and landmasses, a great gift for a little girl. 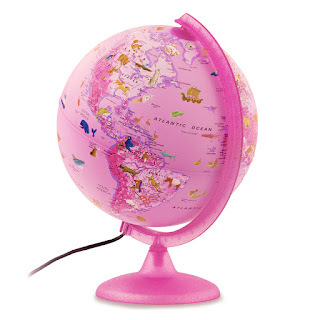 A one of a kind completely pink globe. An internal LED enhances the cartography when used at night. Another excellent choice for use as a back light or night light to illuminate a child’s room. The sturdy acrylic base is also the same shade of pink. The same illustrations of animals and various landmarks are included as in the aforementioned product. The change of color makes this globe particularly suited to a little girl. Learning about geography with a great educational toy like this one is a positive way to influence children and help them gain an understanding of the world around them.